Commending whats commendable in others refreshes them and honors God. 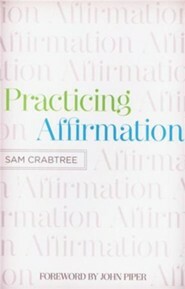 This book helps readers strengthen communication and relationships through the practice of God-centered affirmation. How does affirmation fit into a Christian's life? Isn't that simply a humanistic, self-esteem, ego-boosting tool for getting along with others? 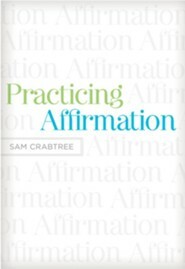 In Practicing Affirmation, Sam Crabtree skillfully makes a case for and gives practical applications of biblical commendation of others. He states, "[W]e ought to praise God rather than man, while acknowledging that the praise of God does not forbid all praise of others. It only prohibits the praise of others in ways that diminish Gods glory" (p. 18). Right from the beginning, Crabtree understands the biases of Christian readers and uses Scripture to defend his thesis that affirmation is a required part of blessing one another. Some of the verses he quotes demonstrate the purpose of building each other up so that we will continue to love one another and do good for the Lords good name (see Heb. 10:24; 1 Cor. 14:26; Rom. 15:2; 1 Pet. 3:9). 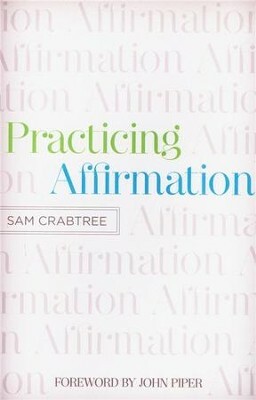 Along the way, Crabtree gives pointers on proper motivation, what to affirm, responding to compliments, affirming unbelievers, and balancing it with correction. The importance of exercising affirmation becomes clear as our relationships take on a refreshing rather than demanding tone. By becoming the advocate of our children, our spouses, neighbors, and friends, we gain permission to speak to their hearts. Crabtree tells the story of strengthening the relationship with his 11-year-old daughter, saying, "I became a student of her," in order to find her God-honoring traits and communicate those to her (p. 57). He continues, "The aim is to glorify God by refreshing people as we help them to see God at work in their lives, moving them toward Christlikeness" (p. 69). And this is truly the point of the book. Much like a letter written by Paul, Crabtree begins his book with doctrine and follows it closely with practical living. The first half of the book covers the "why" and "how" to properly affirm one another, which should be read slowly and thoughtfully. The second half moves much quicker, as he goes through a list of "Mistakes I Have Made," followed by anticipated questions and answers that further explain what godly affirmation looks like. He also wisely includes "100 Affirmation Ideas for Those Who Feel Stuck," which provides a very specific list of ways to commend coworkers, family, and even missionaries. I'm the author/artist and I want to review Practicing Affirmation.